- John Wayne heads up north in Henry Hathaway's 1960 comedy/western North To Alaska. Fairly amusing, well put together, and including a nice performance from John Wayne, North To Alaska is not without its shortcomings. Buddies Sam McCord (Wayne) and George Pratt (Stewart Granger) have struck it rich in the tail end of the Alaskan Gold Rush, allowing George the finances to bring his French fiancée Jenny up from Seattle and build the "honeymoon cabin." Saying behind to build that cabin, George sends Sam to Seattle to fetch back his French sweetheart. However, when Sam gets to Seattle he encounters a problem: Jenny has married someone else. Trying to fix the situation, Sam comes up with a dumb idea (and to his credit he admits as much) to bring back a different French lady, Michelle "Angel" Bonet (Capucine), that he met in a "gentleman's club" to cheer up the soon to be poor 'ol broken hearted George. But letting each other go soon proves to be a hard thing for both Sam and Angel to do. To make matters even more complicated, Sam and George must now fight against a shifty criminal to keep their gold mine. North To Alaska is very cartoonish in nature and much of its so-called comedy is not very funny at all. Unbelievably stupid slapstick, supposedly humorous animals (many times involved with the stupid slapstick), and tweedy bird noises are in abundance and just are not funny. Also, obviously trying to repeat the popular casting of Ricky Nelson in Rio Bravo (1959) just one year prior, late 1950s and early 1960s teen heartthrob Fabian is cast as George's horny little brother Billy. The attempt to recreate the success of Nelson and Rio Bravo fail miserably here with Fabian and North To Alaska because Fabian is not good at all, he is actually incredibly annoying. Still, despite these negative aspects, North To Alaska does include some things that are worthwhile. John Wayne is very entertaining, throwing around as many wisecracks as punches, and Stewart Granger gives an enjoyable performance - both of these guys are responsible for the successful attempts at comedy. Also, Capucine works well in her role as the take charge Angel - and there is no wondering why every guy is falling all over themselves over her throughout the film (she's hot)! Director Henry Hathaway does the film a whole lot of good. Where the tweedy bird noises and goofy animals hurts the film, Hathaway gives the film a good flow and creates a great look. 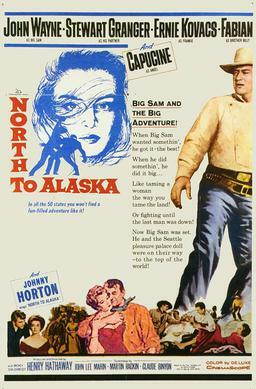 Every aspect of the film's cinematography is great but the Alaskan wilderness is captured especially well, making the film unique within the western genre. While North To Alaska is not a particularly excellent or even a consistently fun film, it does have many good things going for it and you will not find another western quite like it.